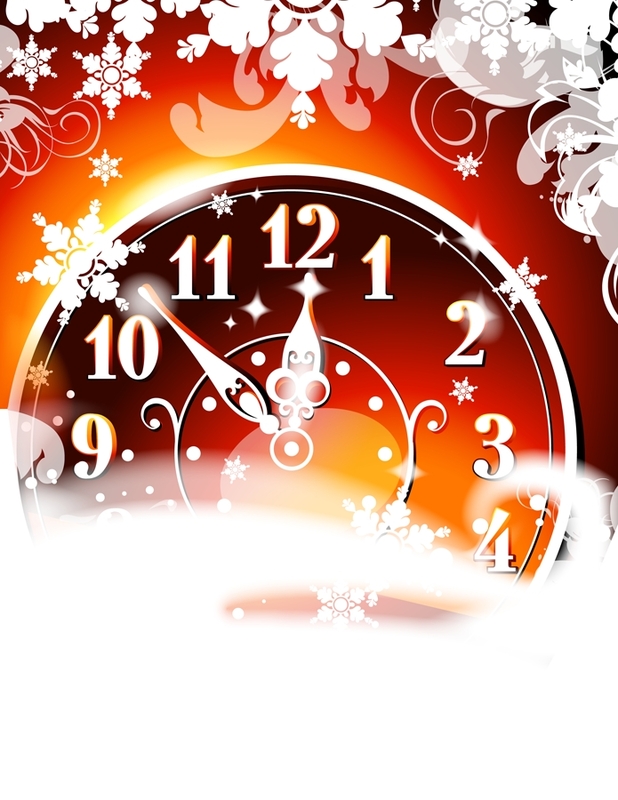 As 2010 draws to a close, we’d like to take a moment to wish our entire Peirce community a very happy and healthy New Year! Thank you to all of our students, alumni, faculty, staff, and friends who made 2010 so special. We are eagerly anticipating all that 2011 holds, and are looking forward to another successful year for the College. Exciting news for students and recent alumni of our Paralegal Studies program: Peirce College now has a chapter of Lambda Epsilon Chi (LEX), a nationally recognized academic national honor society for paralegal students. 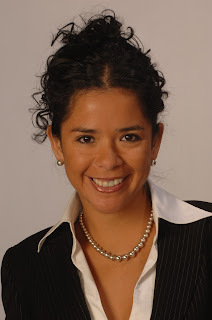 LEX is sponsored by the American Association for Paralegal Education (AAfPE) which offers national scholarship opportunities and networking opportunities with other legal professionals. Induction into the society is based upon academic excellence. Candidates for membership in LEX must be in good academic standing (a cumulative and major GPA of 3.5 or higher) at Peirce College as a Paralegal Studies Bachelor of Science student or as a Post-Bachelor Certificate Paralegal Studies student. 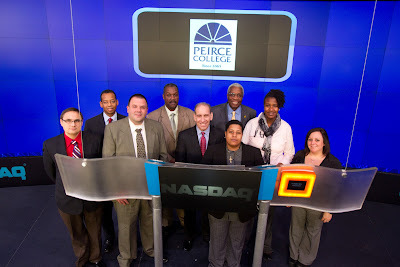 Peirce College will induct students into LEX during the spring semester of each year, starting with Spring 2011. Eligible students will be contacted by the Dean of Students, Rita Toliver-Roberts, with an invitation to join the honor society. More information about LEX membership can be found on the Peirce College Paralegal Student Association site. The past year has been a busy and exciting one for the Paralegal Studies program here at Peirce College. Our students and alumni are doing great things and the program is more involved than ever in the local legal community. In case you missed something, are interested in getting involved, or are simply curious about what the Peirce Paralegal Studies program is all about, here’s a rundown of some of the great things that happened in Fall 2010. Our students, faculty, and alumni continue to engage in activities, seminars, and forums that contribute to the growth of the profession and mentor the next generation of paralegals. 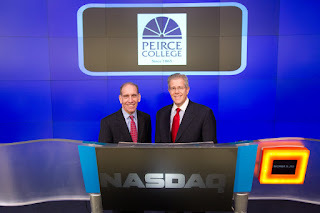 © 2010, The NASDAQ OMX Group, Inc.
Career development and networking are big parts of the Peirce College experience. We’re always looking for new and interesting ways to connect students with professionals working in the fields they’re headed for. The relationships made through networking often serve as career launching pads down the road. On Monday, a group of nine Peirce College students, faculty, and administrators participated in one of our most exciting networking opportunities yet. 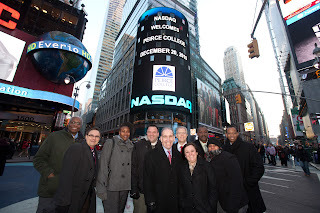 They attended the NASDAQ Career Day/Diversity event in New York City, and rang the NASDAQ Closing Bell! Students met NASDAQ OMX business leaders, including Peirce College trustee and graduate Bill Morgan ’87 who is currently the Senior VP for Global Human Resources at NASDAQ OMX. Bill and his colleagues gave an overview of the exchange, what their days are like, and spoke about the diversity initiative and career opportunities within the organization. Before ending their day at the MarketSite location in Times Square, the students toured Wall Street and visited NASDAQ’s One Liberty Plaza location. Clark Atlanta University students and faculty were also in attendance for the event. Dr. Wanda Owens from Clark Atlanta joined Peirce President James J. Mergiotti in presiding over the NASDAQ Closing Bell. Both institutions were recognized for their longstanding history and commitment to diversity before students and faculty joined President Mergiotti and Dr. Owens on the podium to ring the Closing Bell. 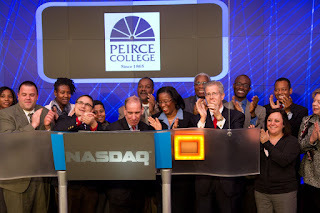 For photos of Peirce College at the closing bell ceremony and a video clip of the event, visit NASDAQ’s Events page and click on the “Peirce College” market close dated 12/20/2010. A special thanks to Bill Morgan for facilitating the event. It was a great opportunity for Peirce students to hear directly from an alumnus who’s built a successful career on the foundation of a Peirce education. Peirce Business students who participated in yesterday’s event include: Felicia Roton, Dione Pride, George Courtyne, Wesley Vesterby, Niche Adderly, and Cazie Perry. 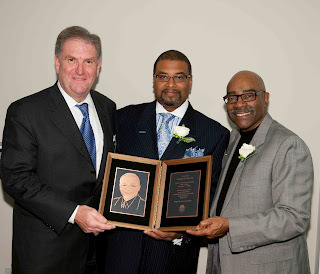 I’m excited to share with you that the revitalization effort for the Peirce College Alumni Association has recently achieved two significant milestones. 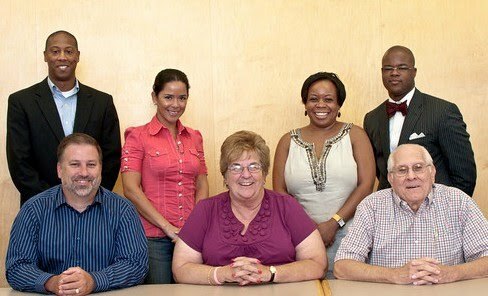 All of the new Alumni Association Board members, along with Trustees Bill Morgan '87 and Renee Branch '90, have been part of a Task Force that has been hard at work since the early summer. The Board has already decided that its first three areas of programmatic emphasis will be in Career Development, Admissions, and Outreach. It will also be working to create a strategic plan for the new Association that will be unveiled at the Spring Reception on campus on Monday, May 23. We’re excited to see where the road takes us and encourage the input and involvement of all our alumni. Are you or any other Peirce alumni you know interested in joining this effort? If so, we’d love to hear from you. Please e-mail Rosemary Connors, Chief Alumni Engagement and Annual Giving Officer, or give her a call at 888.GO.PEIRCE, ext. 9003. Thank you to all who have already put so much time and effort into revitalizing our Alumni Association -- it is exciting to see that the enthusiasm and commitment shown by so many Peirce students doesn’t have to fade once you complete your degree! We look forward to continuing to build ways to connect our alumni to one another and to the College. 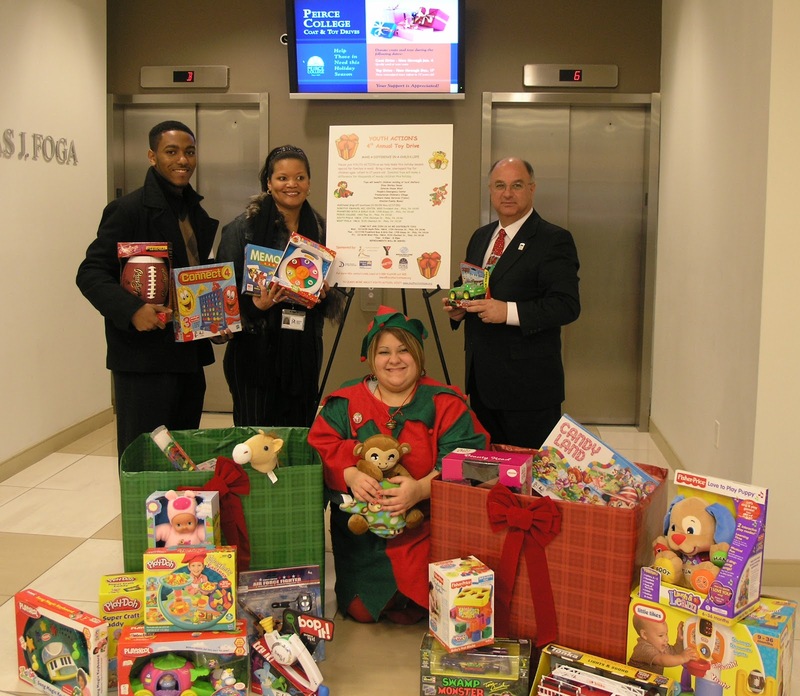 Continue the Peirce tradition of giving and help make the holiday season a little brighter for local children this December by participating in Peirce College's Second Annual Toy Drive. We are still accepting donations of new, unwrapped toys or books for children (infants through 17 years of age) in collection bins located in College Hall, now through Dec. 17. At the conclusion of the toy drive, held in partnership with local community service organization Youth Action Team, donations will be distributed to children residing at area shelters. Thank you in advance for your contribution! We appreciate your support and generosity. For more information about the drive, contact Jessica Quilter or call 888.GO.PEIRCE, ext. 9430. Some of the generous donations collected from last year's Toy Drive! We have plenty of internship and career resources for you right here in the CDS department, so don’t hesitate to contact us or stop by to find out about relevant opportunities for Peirce students and alumni. You can also visit our online job board to browse openings, or set up a meeting with a Career Advisor to talk about your goals. We can work with you to perfect your resume, practice interview techniques, and secure an internship. 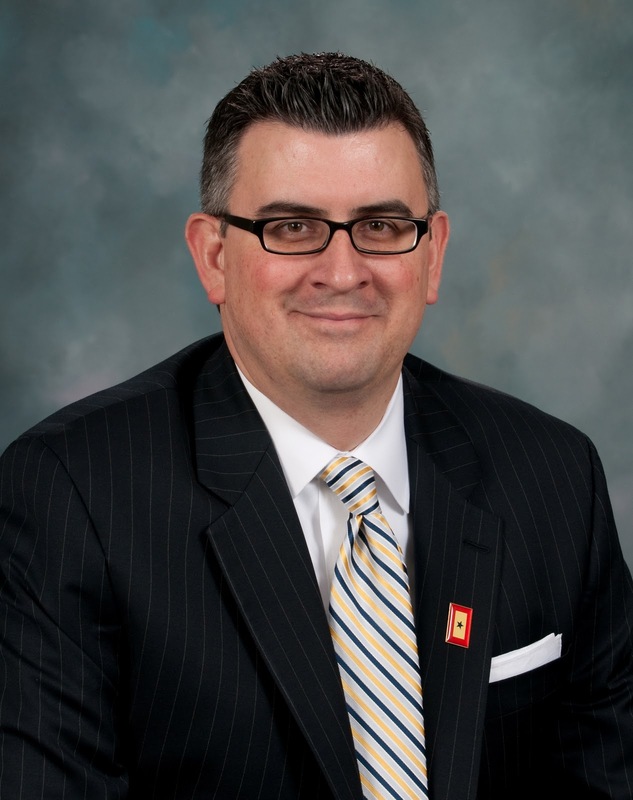 Please join me in welcoming Thomas Bajus to the Peirce College Board of Trustees. Mr. Bajus was elected at the recent November board meeting. 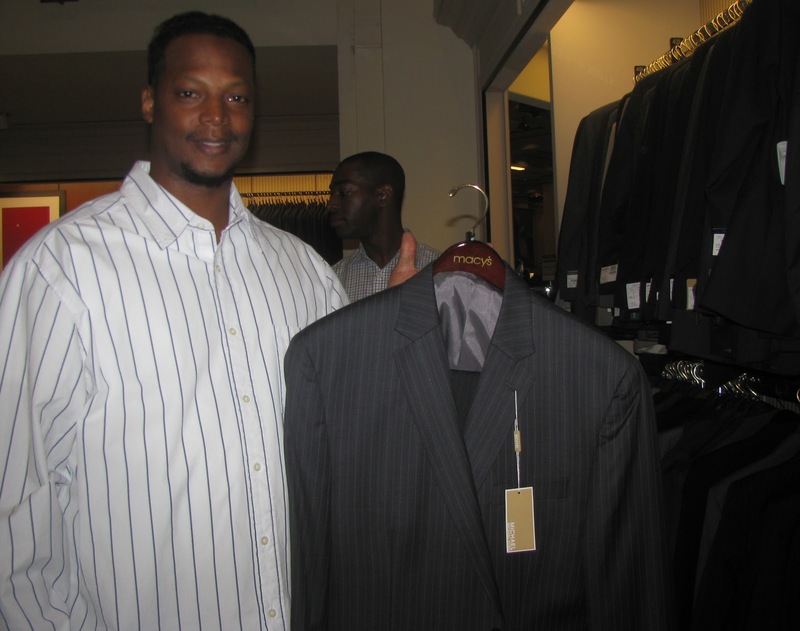 He is Managing Director of the Retail Municipal Trading division of Philadelphia-based Janney Montgomery Scott LLC. 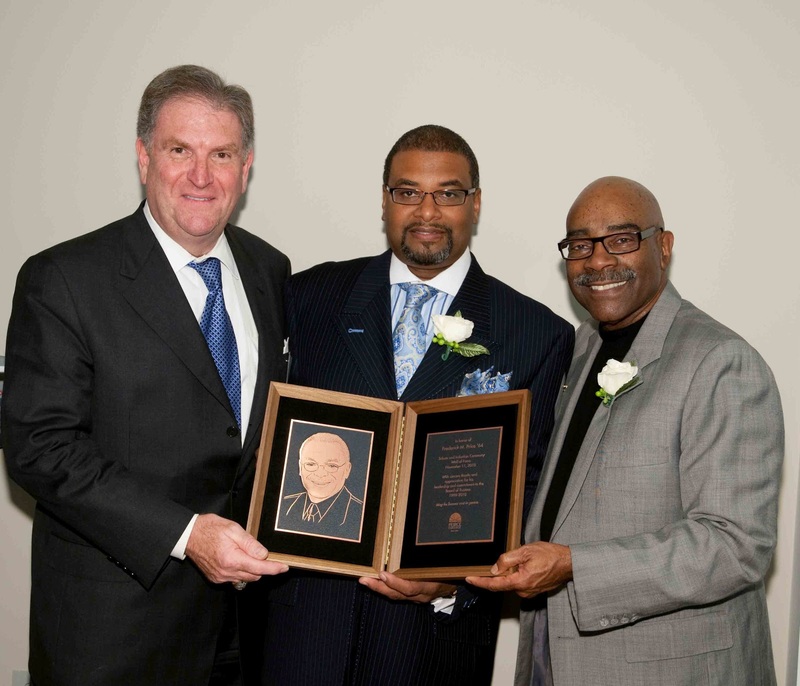 We look forward to Mr. Bajus’ contributions to the future direction of the College as he takes his place on the Board. A full news release with detailed information about his experience is included below. It was also distributed on Business Wire. And since the first of three volumes of the "Autobiography of Mark Twain" was just published this month, we think there's no time like the present to share the letter he wrote to Peirce 125 years ago. 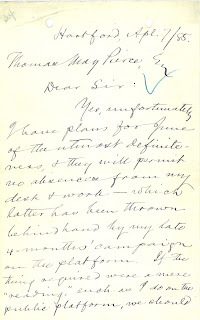 In the spring of 1885, Peirce founder Thomas May Peirce wrote to Samuel Langhorne Clemens requesting that he speak at the College's commencement ceremony. Clemens was a famous American author who went by a much more recognizable pen name -- Mark Twain. In 1885, just one year had passed since he'd published "Adventures of Huckleberry Finn." Unfortunately, "the father of American literature" (as William Faulkner called him) was unavailable for the speaking engagement. He explained as much in a letter addressed to the Peirce founder that has become a piece of the College's history. As "keeper of the archives," I'm sharing it with you! Read on for the full text, and download a copy of the original document by clicking the image to the right. Yes, unfortunately I have plans for June of the utmost definiteness, + they will permit no absences from my desk + work -- which latter has been thrown behind hand by my late 4-months' campaign on the platform. If the thing acquired were a mere "reading," such as I do on the public platform, we should doubtless have no trouble as to price, if I were situated otherwise than I am as to time; but an address is another matter. I would deliver none but one which should satisfy me, personally, -- + such a piece of work would require time + pains. The price I should charge would be simply an outrage, + we couldn't agree. But I am wandering from the point, since matters are as set forth on my other page. Technology in Education: Florida school replaces textbooks with Kindles ... what’s next? The past decade has seen rapid technological advancements in every industry -- energy, healthcare, construction, communication, transportation, entertainment, and, of course, education. 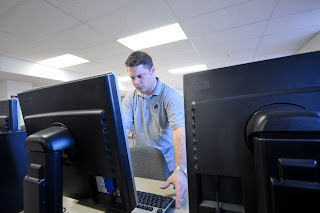 While campuses across the country are doing their best to stay on the cutting edge, the ever-changing nature of technology makes harnessing it for educational use an ongoing challenge for those tasked with delivering technology to their students. But it looks like one school is finding ways to stay ahead of the curve, and its faculty, staff, and students are making news. The headline that piqued our interest? “US School Replaces Textbooks with Kindles, Students Go Crazy.” The story, published on The Next Web, is about Clearwater High School in Pinellas County, Fla., the first school ever to distribute e-readers school wide. Because this story speaks to the larger topics of technology and mobility in education, we thought it was a great opportunity to approach the school district about a possible interview with someone involved in the program. Enter John Just, Pinellas County’s Assistant Superintendent for Management Information Systems, who was kind enough to talk with us about this history making initiative. Mr. Just offered some terrific insight on what goes on behind the scenes of launching a program like the one at Clearwater High School, how it impacts students and teachers alike, and the potential for the future. Click play below to hear the interview in full. 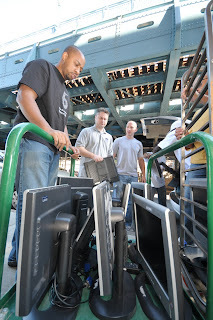 At Peirce, we recognize that technology and education are more closely linked than ever. Just as we have worked to make our online classes as accessible as possible, we recently introduced new smart phone applications to expand mobile access to resources at the College, including a new mobile site for our online learning platform. We will continue to track trends and developments in technology and report what we find. What do you think is next? 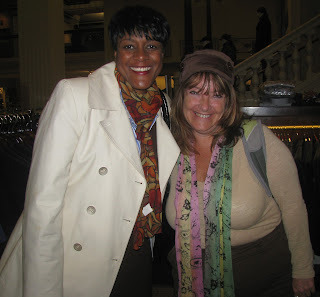 Cynthia Bradley graduated from Peirce College in 1989. She walked away with her associate degree in General Studies, and to this day, she proudly carries a copy of that degree in her wallet. Cynthia took a bit of a detour first. The year 1989 didn’t just bring her first degree, but her first child, Ashley. Cynthia instantly became a role model to a little girl who would grow up to attend college where she studies biology. Today, Ashley’s aspirations include attending medical school in 2012, where she plans on specializing in Pediatric Dermatology. Cynthia marvels at her daughter’s ambition, and knows that her own education was the start of something big -- a family that knows graduating from college is a must. We told you about those 45,000 new healthcare jobs that are coming to Philly over the next 10 years. You might be wondering where exactly those jobs will be. I came across an interesting article in the New York Times last month that provides a great illustration of the expected growth in the health information management field, particularly surrounding patient records. What’s the big deal? They’re going electronic. 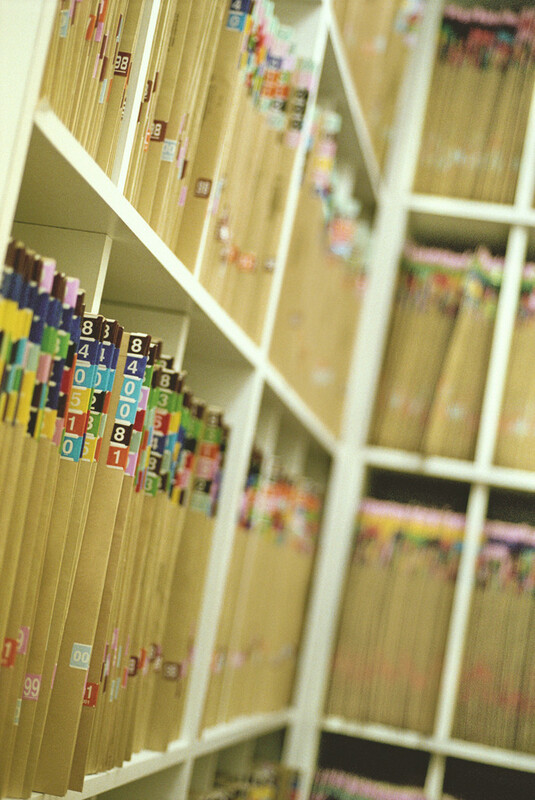 It’s an inevitable shift – everything is digital, so why wouldn’t medical records follow suit? Given the drawbacks of paper records including illegible handwriting and single user access, it’s a logical idea that automating processes like order entry for prescriptions will be common practice as well. 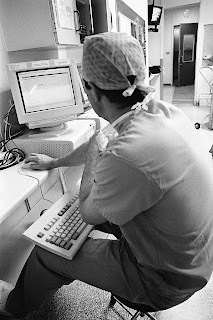 The article by reporter Steve Lohr further demonstrates the inevitable shift toward electronic health records (EHRs) for large hospitals and small physician practice alike. 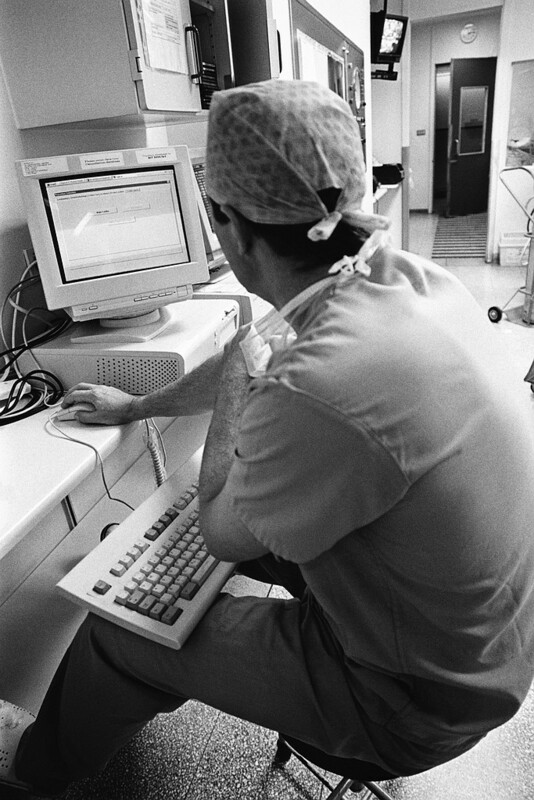 An accompanying post in DealBook refers to Mr. Lohr’s reporting that “medical experts have long agreed that digital patient records and electronic prescribing can help improve care and curb costs.” And with the Obama administration’s economic stimulus package, there is a renewed push (coming in the form of incentive payments) to encourage the use of electronic health records. So what does this mean for you as a student pursuing a degree in healthcare information management? Jobs! 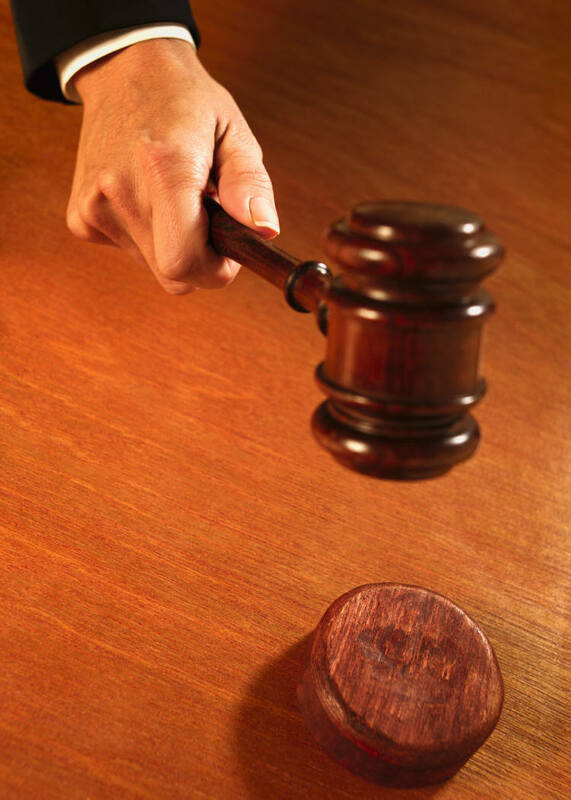 Whether it is in medical offices, technology companies, law firms that deal with healthcare law, etc. I’m always watching the trends and growing areas of the industry, so I’ll continue to share things here with you. There was a great segment on FOX29 this week talking about the School District of Philadelphia’s Parent University. It’s an important education initiative that we at Peirce are very proud to be a part of! This summer, we were selected to provide a General Studies degree program for parents involved in Parent University. On Sunday, Nov. 7, student members of the Peirce College Ambassadors Club rolled up their sleeves and tied on their aprons to provide breakfast for families at the Philadelphia Ronald McDonald House (PRMH). 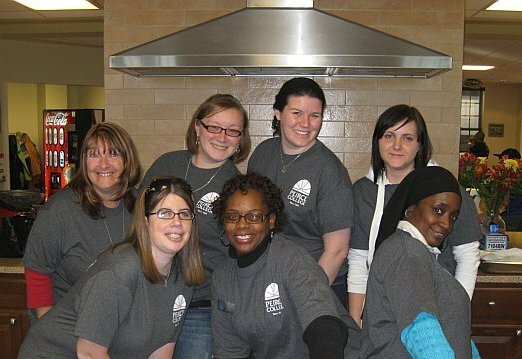 The group was on hand bright and early to volunteer as part of the Guest Chef Program at the Front and Erie House, which is located next to St. Christopher’s Hospital for Children. The house offers a home-like environment for 17 families a night, providing the comforts of home and support from PRMH staff and volunteers. Alyson Rodgers, Peirce Enrollment Representative and co-advisor for the Ambassadors Club, worked closely with our student ambassadors to organize this community service opportunity. For those of you who might not be familiar with the group, the Ambassadors Club allows students to share their Peirce pride and spread the word about the College in our community and with prospective students. Volunteering in the Philadelphia community is just one of many ways that the ambassadors share their excitement about Peirce and serve as College representatives. Peirce's online learning site now available on your smartphone! 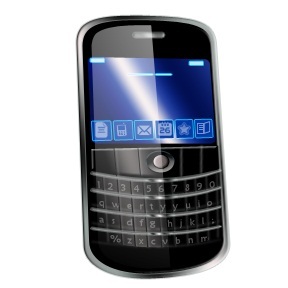 The functionality of the mobile site will not replace using a computer or laptop to take online classes. 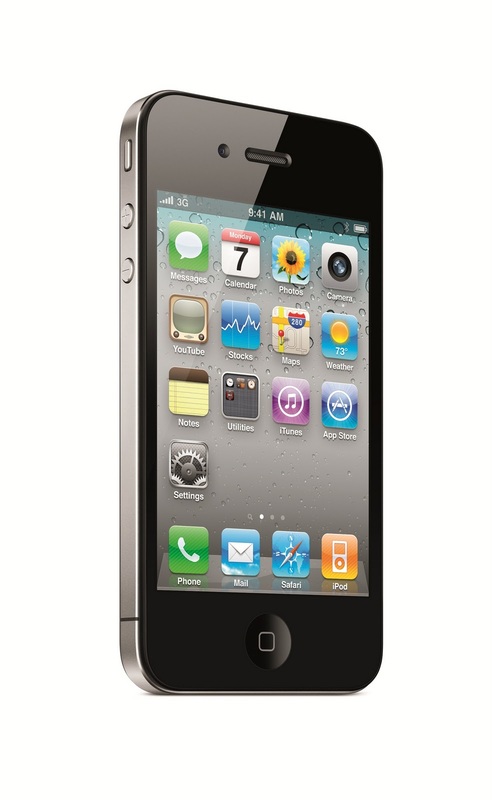 But it's a great way to stay on top of assignments, due dates, grades, and discussions while you're on the go. You may remember that Peirce held a blood drive in partnership with the American Red Cross back in April. There is another chance coming up to save a life by donating blood! We are teaming up with the Red Cross again, and will be hosting another blood drive on Monday, Nov. 29, from noon to 6 p.m. The drive will be held on campus, in rooms 51 and 52 of College Hall. This opportunity is open to all students, alumni, faculty and staff. If you would like to give blood, please visit the Red Cross Web site to schedule a time to donate. Students and alumni can also visit my.Peirce.edu to sign up today. The Red Cross recommends that you allow 45 minutes for your donation session, so keep that in mind when selecting an appointment. 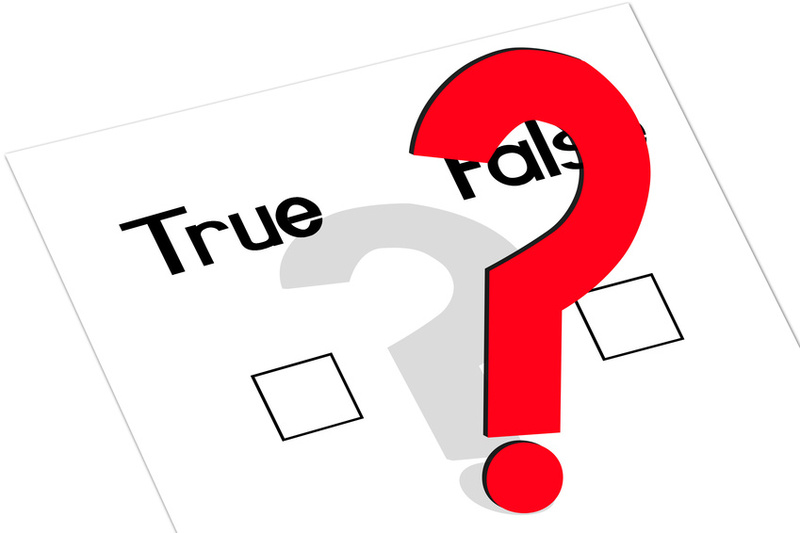 Not sure if you are eligible to donate blood? To be sure, check the donor eligibility guidelines online or call 800-GIVE-LIFE (choose Option 4). This is a great opportunity to give a meaningful gift to the community -- your participation will help provide life-saving blood to those in need. 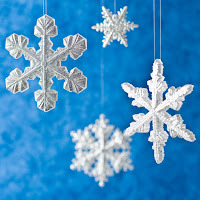 For more information and tips on how to have a good donation experience, visit http://www.givelife2.org/donor/tips.asp. On Friday, Oct. 22, over 1,150 international students, scholars, and professionals from across the Delaware Valley attended the 41st annual International Students Reception at the Penn Museum. Some of Peirce’s own international students attended. Elsarra Elamin, from Zimbabwe, is pursuing her degree in Business Administration with concentrations in Management and Accounting. Rijesh Shrestha, from Nepal, is also part of Peirce’s Business Administration program with a concentration in Accounting. 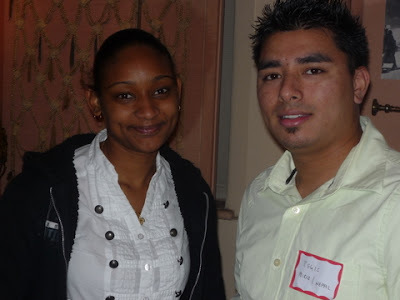 Penn Museum's International Classroom Program hosts this free event to connect international guests with the local community and its leaders and to introduce attendees to the multicultural community of Philadelphia. 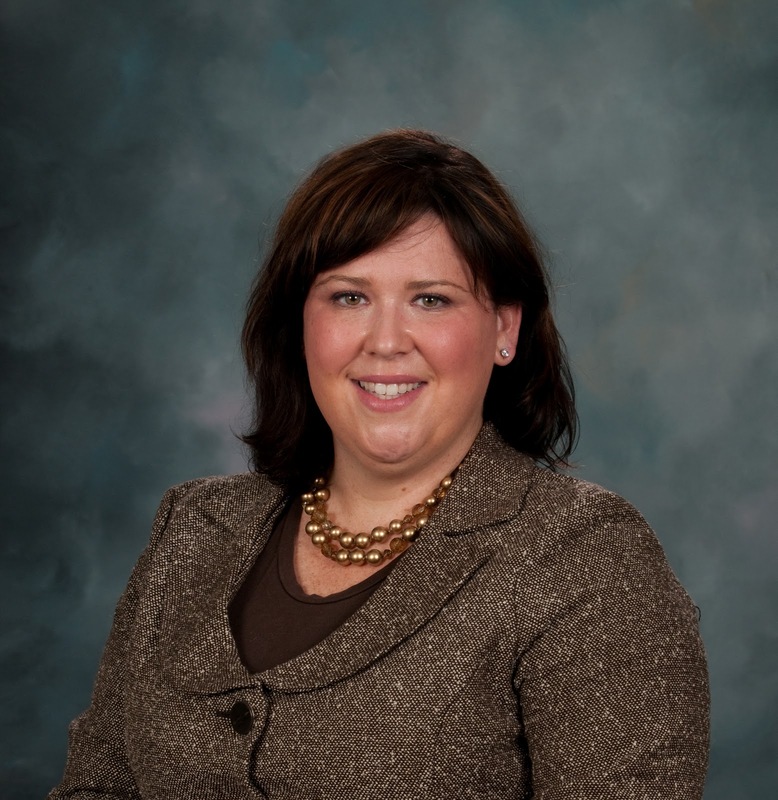 Peirce is among the area co-sponsors who help make the event possible. What does it take to get a healthcare career in Philadelphia? 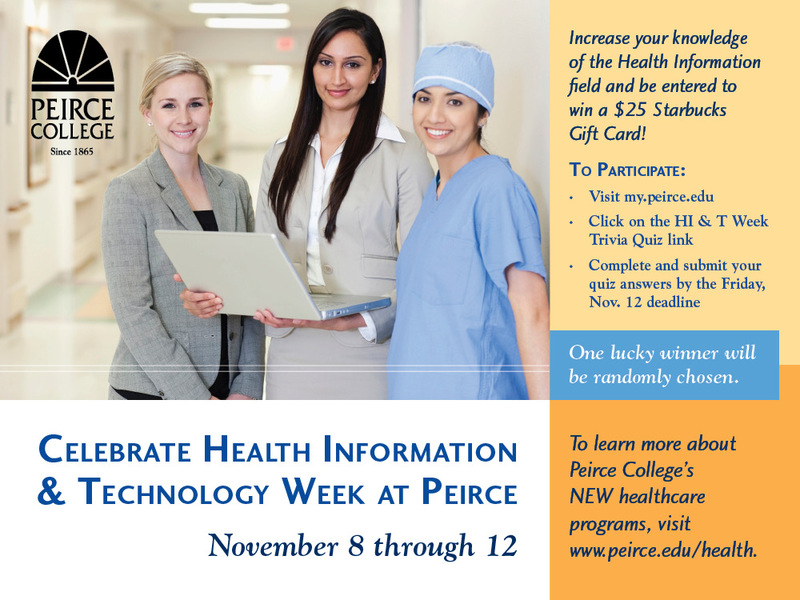 Peirce College launched an awareness campaign this fall that was different than anything we've done before. We wanted to tell Philadelphians The Whole Story about Peirce, and did it by blanketing Frankford Transportation Center with bold banners calling out major ways Peirce can help improve the professional lives of working adults in Philadelphia. 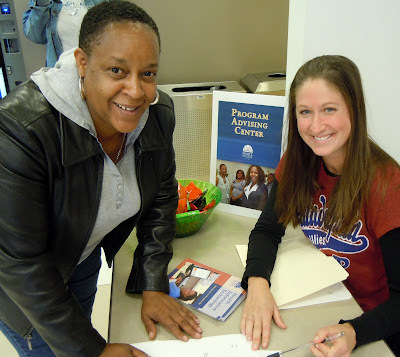 Seeking both a response to our Whole Story campaign and a read on how a few Philadelphians feel about continuing education, we headed to Frankford. Our team of bloggers wanted to know what Frankford commuters thought about the potential impact a degree could have on their careers and their quality of life. So they asked them, and caught it all on tape. Click play on the video below to see what Philadelphians had to say about their education and where it has taken them, or where they hope it will one day soon. Thanks to all the commuters who took a few minutes out of their day to share their story. As for the rest of you, what's your story? We'd love to hear it. Peirce faculty, staff, students and alumni came out over the weekend to give back to their city by volunteering for Philadelphia Cares Day! 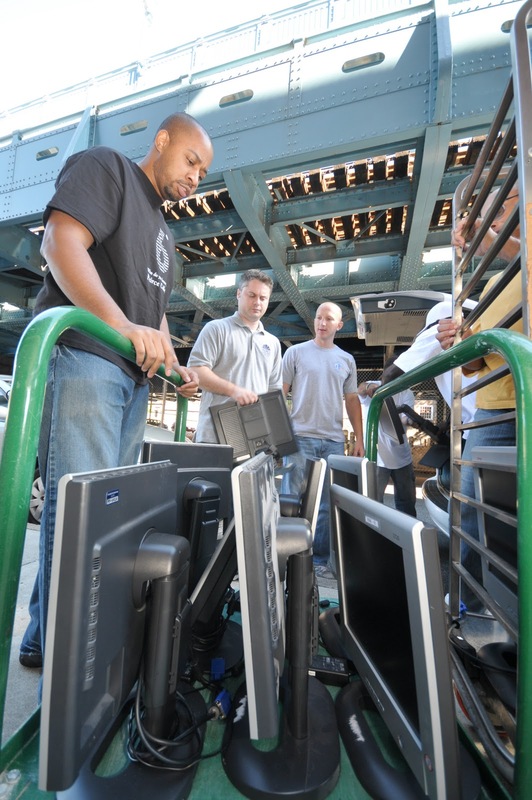 Peirce painted and cleaned at Olney West High School and Thurgood Marshall Elementary School in Philadelphia. 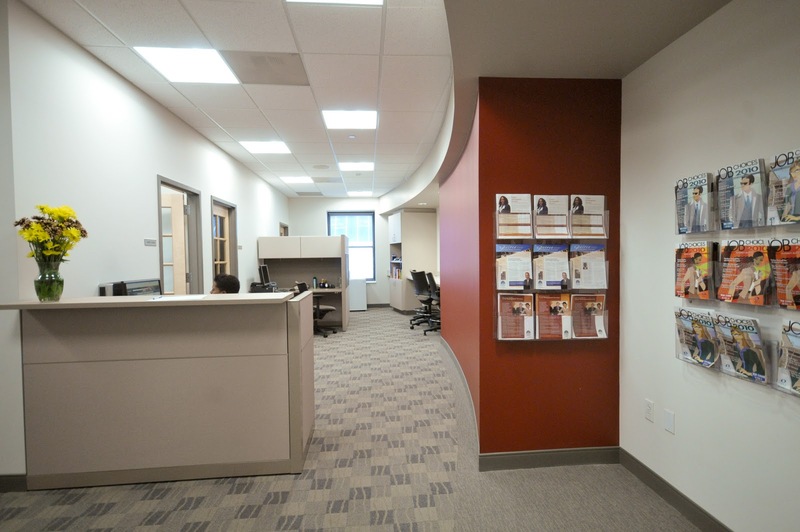 Thursday, Oct. 7 marked the official opening of two newly renovated spaces at the College when the Career Development Services staff welcomed visitors to the new CDS Center, and the renovated library was open for tours. 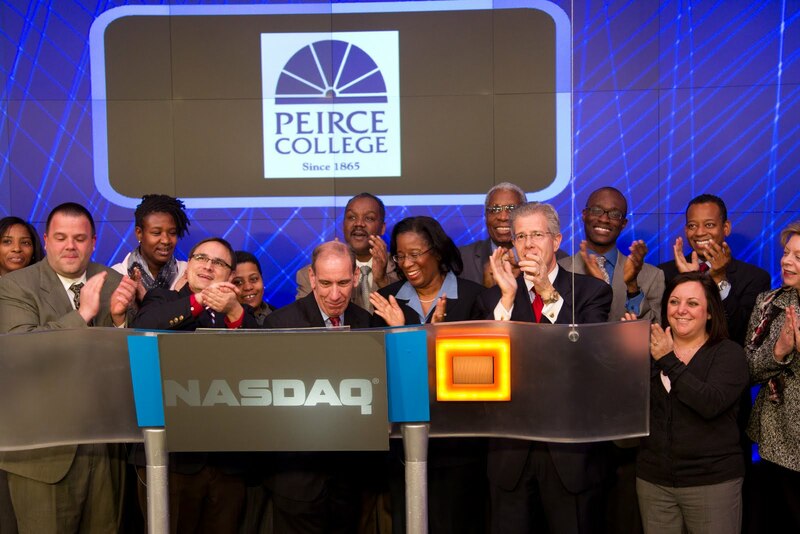 We encourage our students to take advantage of the improvements and investments that Peirce has made on their behalf! These spaces and resources are here to further enhance the educational experience – so please come on in and check out the new technology and resources! To further celebrate their new space and spread the news of their existing services, CDS will be hosting their own CDS Student Appreciation Week Oct. 11-15. So, be on the lookout for information and updates from the CDS team this week! Click on the slideshow below to view photos of the renovations. Every year, Peirce College celebrates Customer Service Week in honor of the College’s tradition and commitment to excellence in customer service. We strive to remind our students, partners, and the entire Peirce community how important our customers are to us, and reiterate our commitment to providing the best services, resources, and support to help our students excel. As part of Customer Service Week’s student-focused programming, we hosted our second annual Student Appreciation Day on Oct. 6 in the lobby of College Hall. This special event marks our appreciation for our students and for their decision to choose Peirce for their educational pursuits. The event featured refreshments and information tables hosted by Admissions; Allied Barton Security; the Business Office; Career Development Services; Enrollment Services; representatives from the Greater Philadelphia Chamber of Commerce, which provided information on special Peirce student memberships; our department of Institutional Advancement; our Program Advising team; IT; Student Financial Services; the Walker Center; and others; including the library staff, who offered tours of the newly renovated space! 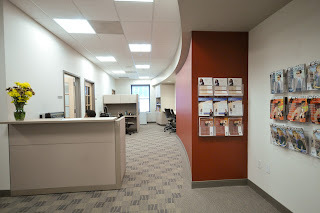 More photos highlighting the renovated Library, as well as the new Career Development Services Center to follow! Peirce is keeping a finger on the pulse of job trends in the Philadelphia region. Why does this matter so much to us? Because it matters to our students who are trying to find a new career. On that note, I have some more good news on the job front. The changing landscape of financial regulation and increased scrutiny of financial reporting and accounting practices in general means a higher demand for accountants, auditors, and related occupations. 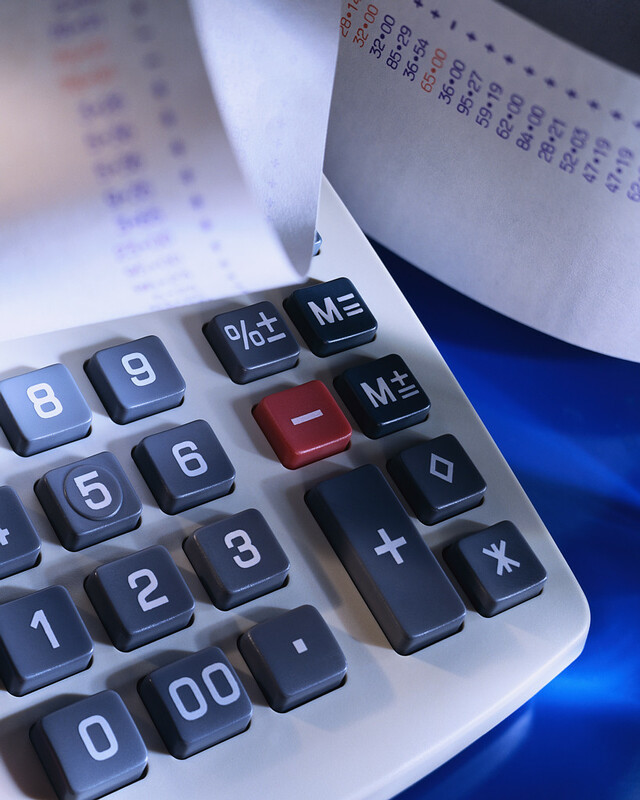 According to the U.S. Bureau of Labor Statistics, the accounting profession is expected to see much faster than average employment growth due to these changes. Understanding the region’s employment outlook allows us to provide the corresponding education that prepares Peirce students to capitalize on those opportunities. 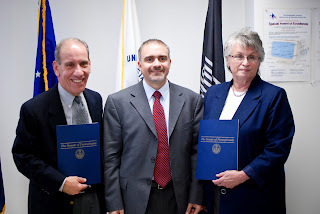 That’s why in addition to our recently launched healthcare degree programs, which will put the 45,000 healthcare jobs headed to this region in reach of our graduates, we’re further expanding our degree program offerings with a new Bachelor of Science Degree in Accounting. 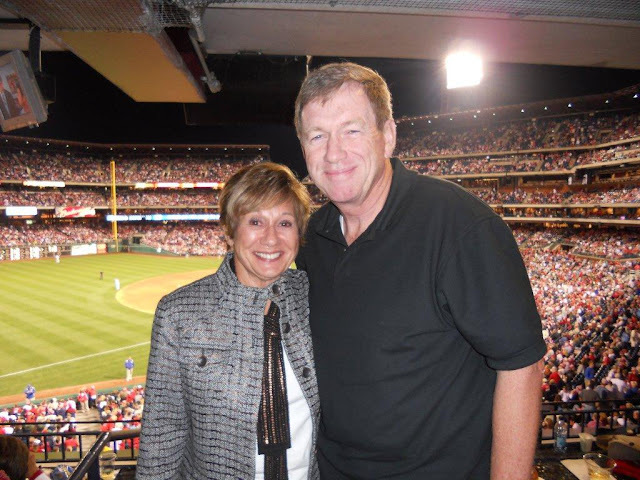 Lawrence Scanlan, chairperson of the Peirce College Board of Trustees, and his wife Connie were among a group from Peirce who came out to a recent game at Citizens Bank Park to cheer on the 2010 NL East Division Champion Phillies. We already gave you a look at where the jobs will be in Philadelphia over the next 10 years, but in case you missed it, here it is again: the healthcare industry. According to the Bureau of Labor Statistics, healthcare is the fastest growing industry in America and will generate 3.2 million new jobs between 2008 and 2018, more than any other industry. Closer to home, employment forecasts from the economic arm of the Greater Philadelphia Chamber of Commerce report that over 45,000 new healthcare jobs will come to the Philadelphia region by 2020. To stay in step with the rapidly growing sector of healthcare services that plays a large part in the Philadelphia region, Peirce College has expanded its degree programs with an emphasis on healthcare, introducing two new degree programs available this fall. On Friday, Sept. 17, Peirce College will mark its 145th birthday! In honor of the College's 145 years educating Philadelphians, let's take a moment to look back at the journey that has led us to where we are today. 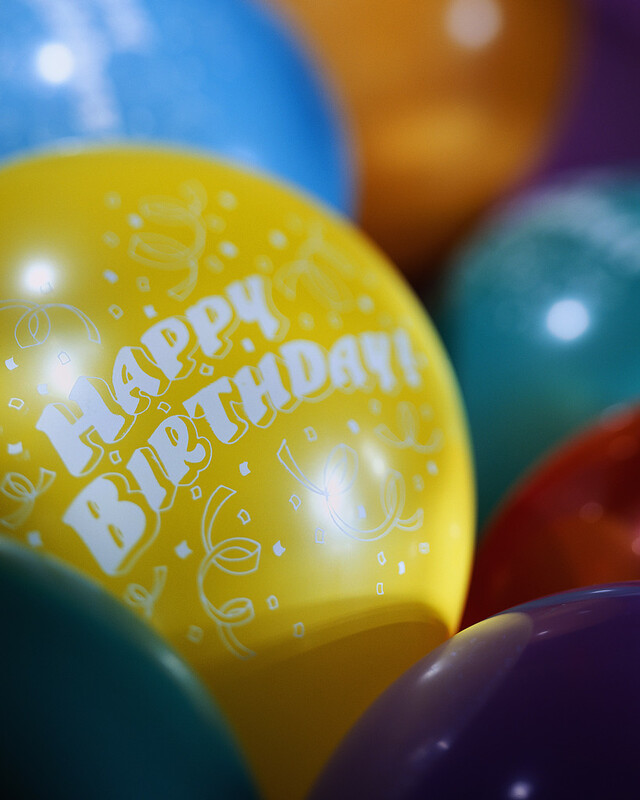 We invite you to wish Peirce a Happy Birthday by sharing your fondest memories of your experience here in the comment section, or reminisce with a post on the Peirce College Facebook page. Check out the slide show below for a glimpse of the past 145 years at Peirce. It’s not too late to sign up to show your Peirce pride and contribute to the education of nearly 200,000 School District of Philadelphia students! On Saturday, Oct. 16, Peirce College will be participating in the 17th Annual Philadelphia Cares Day. 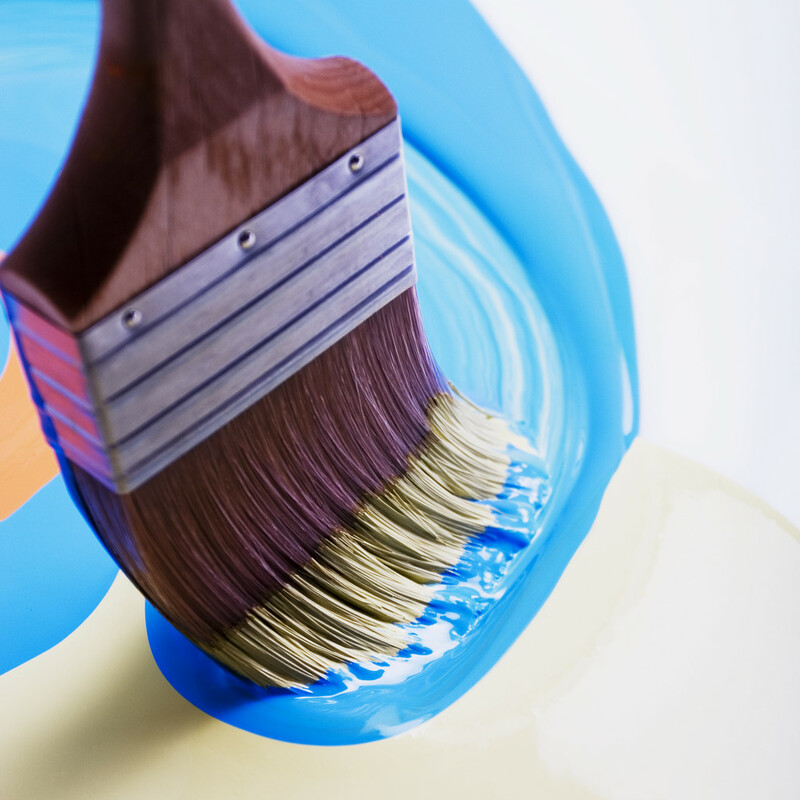 We are organizing a team of students, alumni, faculty, and staff to take part in this marathon day of service where thousands of volunteers will help improve Philadelphia’s public schools by painting classrooms, designing murals, and creating green spaces. A schedule of activities and registration form can be found on Peirce’s website – be sure to register by Thursday, Sept. 30 if you want to join the Peirce team! Volunteers are encouraged to wear comfortable clothes and work gloves if you have them. Continental breakfast and refreshments will be served, but we suggest you bring a bagged lunch to keep your energy up! If you have any questions, e-mail team leader Jessica Quilter, or call her at 888.GO.PEIRCE, ext. 9430. Hope to see you out there! There are some incredible students at Peirce. One of those is Marcia Blair, who found out soon after enrolling that this wasn’t your typical college. Her experiences in the classroom, with advisors, with support staff, and with other students made her realize that for adult learners with a lot more on their plate than earning a degree, this was a special, supportive, and dynamic place to learn. The Admissions Department learned that Marcia had gone above and beyond to help recruit new students to Peirce: talking to friends and neighbors about the opportunities here, explaining the enrollment and financial aid process, bringing potential students to campus, and even helping them fill out applications. 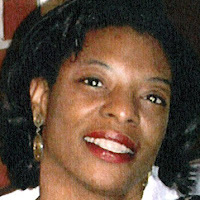 Marcia took a few minutes to talk to us about how she found Peirce, what her continuing education has meant to her, and why she’s taken it upon herself to point others in the Peirce direction. Listen to the podcast in its entirety by clicking on the player above, or download it by right-clicking the podcast link and clicking "save link as" to listen on a portable MP3 player. 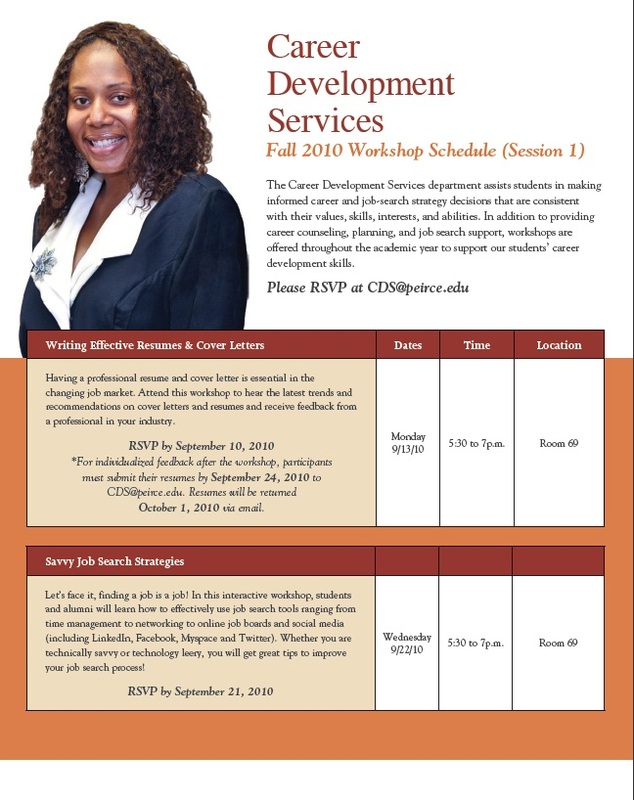 We have a lot going on this fall with Career Development Services (CDS), and we’re excited to share our upcoming events and activities with Peirce students and alumni! Read on for the Fall 2010 CDS Workshop Schedule. You can R.S.V.P. to all events by calling 888.GO.PEIRCE, ext. 9202, or send us an e-mail. Having a professional resume and cover letter is essential in the changing job market. Attend this workshop to hear the latest trends and recommendations on cover letters and resumes and receive feedback from a professional in your industry. For individualized feedback after the workshop, participants must submit their resumes via e-mail by Sept. 24. Resumes will be returned Oct. 1 via e-mail. Monday, Sept. 13, 2010 from 5:30 to 7 p.m.
We’ve talked before about the variety of financial resources available to military members and their families, including Peirce’s own Protect and Serve Grant. It is clearly a very important topic, illustrated by the fact that we continue to field a lot of questions from military members or veterans who are looking to pursue further education. 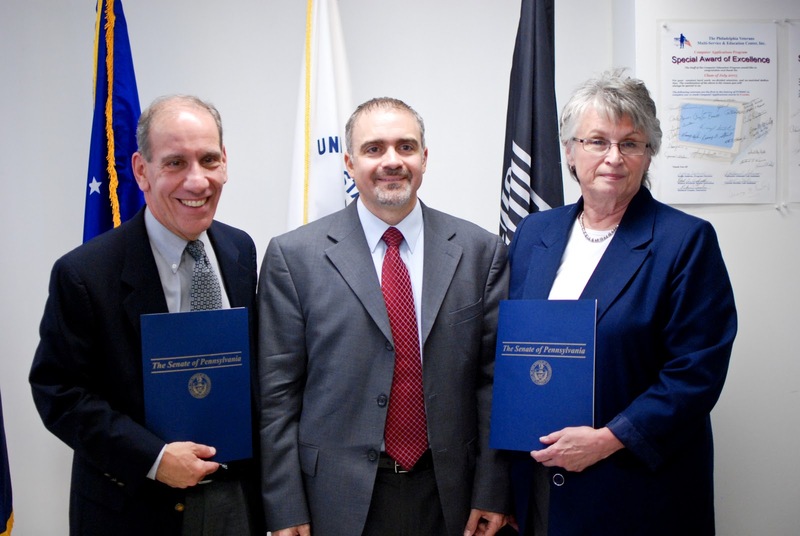 For that reason, we want to make those resources easily available for military members pursuing a degree. Keep an eye on news about the Post 9/11 GI Bill, which is slated for revisions and is currently undergoing proposed legislation in efforts to simplify the benefits. According to Inside Higher Ed, as of late June there were about 700 colleges signed up for the Bill’s Yellow Ribbon Program to fund tuition expenses for veterans. 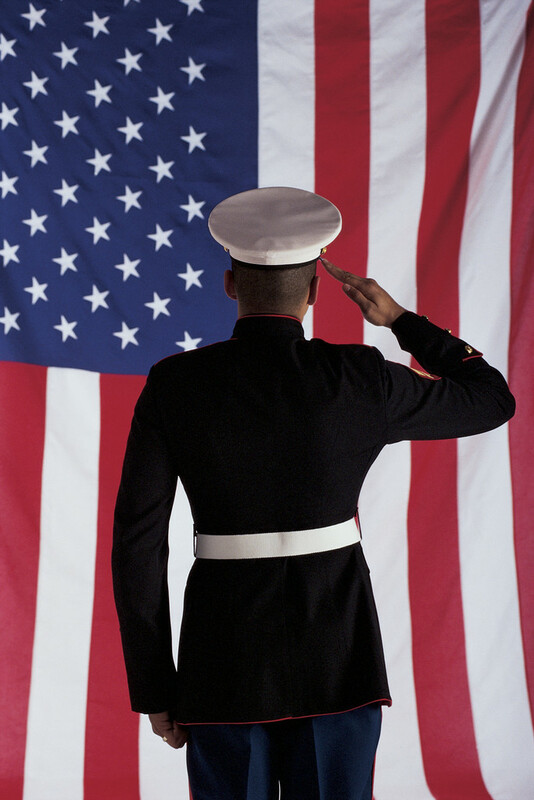 Below is a sampling of some other military scholarships designed to help you and your family reach your educational goals. 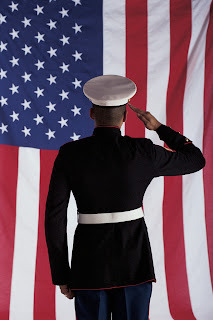 For even more resources, you can visit Students.Gov, AmericaSupportsYou, MilitaryScholar.org, Disabled Veterans Website, Free-4U.com, scholarships4students.com, and Student Veterans of America. 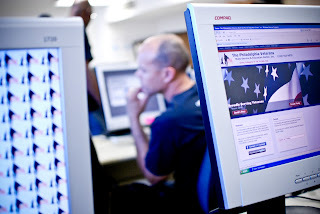 Those that serve our country should have these resources at their fingertips, so if you know a service member who might benefit from this knowledge, please share the information! 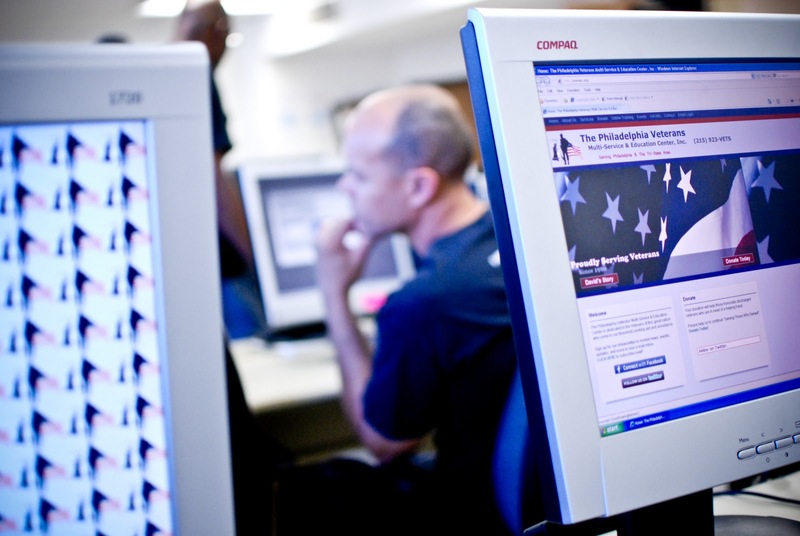 By collecting all of these resources in one place, we hope to make the process easier for military members and veterans who might be searching for support and information as they consider continuing their formal education.